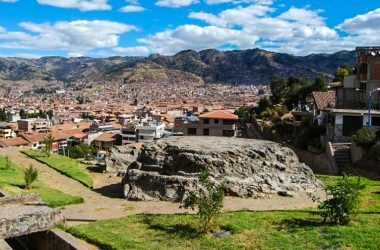 A major discovery, the tomb of a pre-Inca, Wari nobleman was announced in Cuzco this last Thursday, February 24. 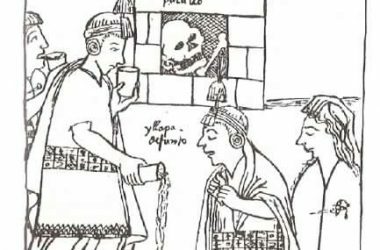 It’s magnificent funeral cache, compared with the splendor of the Lord of Sican, will be on display through March 10 at the Garcilaso Museum, at the intersection of Heladeros and Garcilaso streets. 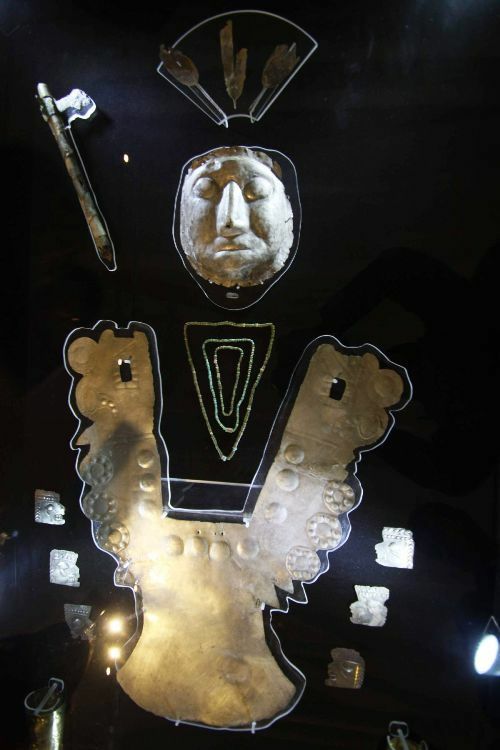 Found downriver from Machu Picchu in the province of La Convención, near Vilcabamba, The tomb’s wealth consists of an impressive silver mask covering the deceased lord’s face, along with a chest covering of the same metal. The Lord also had golden bracelets and two staffs of wood covered in silver, as well as various other ornaments. With the staffs, the figure is reminiscent of the Staffed God, a major religious image that was characteristic of the Wari empire and the Tiwanaku Empire that coexisted with it. While Tiwanaku was centered on the south end of Lake Titicaca and is famous for its Gate of the Sun with the central figure of the Staffed God, Wari had its capital in the site of Wari in Ayacucho and dominated not only Cuzco, where the impressive city of Pikillacta is found, but extended also to the coast and Peru’s north. Wari was a very important precursor of the Inca’s. 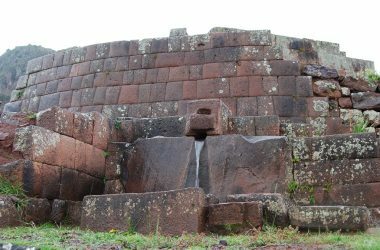 Arguably it’s prior existence enabled the rapid expansion of the Incas out of their Cuzco heartland to occupy the massive expanse of territory that became Tawantinsuyo, the Inca Land of Four Quarters. The area around Vilcabamaba in Cuzco has long been shrouded in suggestions of past glory. After the Spanish invasion the remaining Inca fled to this area and made war on the Spanish for decades before the new empire was consolidated in Spanish hands. 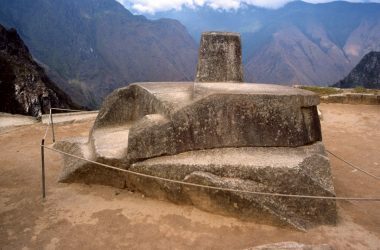 Found at the extensive site of Espíritu Pampa, the tomb of the Wari Lord, is one of nine excavated by Peruvian archeologists. The discovery’s importance, according to archeologist Luís Lumbreras, besides the magnificence of its artifacts, comes from its demonstration of major Wari occupation of the jungle lowlands. This civilization evidently built itself from control of food supply and exchange of goods that combined jungle, highlands, and coasts, a vertical system that the Incas continued. 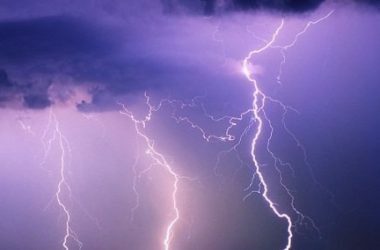 Finds of this nature are extremely rare in the humid lowlands. Organic material disappears quickly. But the funeral offerings in this pit tomb remained and retain their splendor. As a result, their display is significant. For two weeks they add to the significant collection of the museum located in the splendid home of the great literary figure who was a son of a Spaniard and a noble Inca mother, Garcilaso Inca de la Vega, also known as The Museum of Regional History. 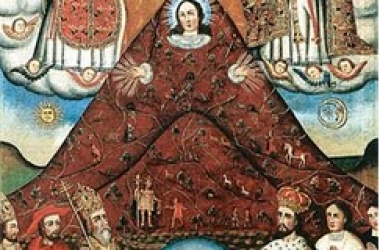 Its collection is both strong in colonial art from the Cuzco school and pre-Inca artifacts. It is open Monday through Saturday, 8 am through 7 pm.